We love aging cocktails in oak barrels. Barrel aging a cocktail will mellow the drink and add a pleasant smoky character. So we thought, “Golly! 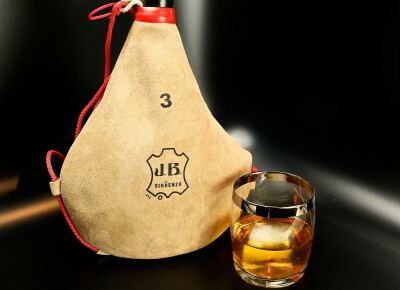 Why not try aging cocktails in a leather wineskin.” Instead of the smoky depth which aging a cocktail in a charred barrel gives to your drink, the wineskin provides a nice leathery complexity to the cocktail. We love wineskin-aging cocktails made with brown spirits (Bourbon/Rye/Cognac…), bittered cocktails, and even gin cocktails as that spirit’s botanicals marry nicely with the leather. Age to taste, but we feel that they are just right after about four days and up to two weeks. (The first cocktail you age in your new wineskin will take one the leathered notes quite heavily. After that, the leathering will be more moderate and uniform.) Once it tastes just right, you can bottle it or leave it in the wineskin to enjoy. If it starts getting too leathery for you, then top off the wineskin with fresh ingredients much like a half-emptied Sherry cask is topped anew via the solera method. Check out some of our Leathered (Wineskin-Aged) Cocktails and enjoy! You will need a traditional leather wineskin (bota). Unlike a modern bota (which you might find at a tourist shop and that will probably be lined with a plastic or rubber bladder), a traditional wineskin will simply be: goat skin, sewn tightly, and sealed with pine resin. The botas we buy are produced by Jesus Blasco of Spain. Go to www.botasdevinojb.com to learn more about him. You can order wineskins from him through www.mibotadevino.com.